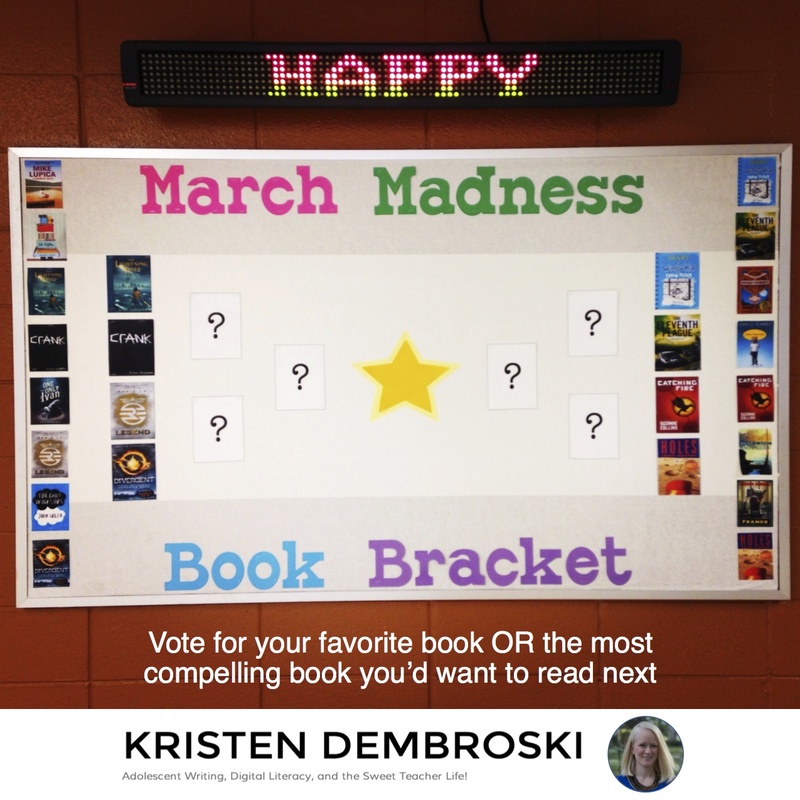 bulletin boards | Kristen Dembroski, Ph.D. Tomorrow, the students will arrive. Not all of them, just the 6th graders. We are trying a new thing this year – slow integration and transition. The rest of my students, 7th and 8th graders, will come on Friday. I am so excited for this new school year! So much is new. 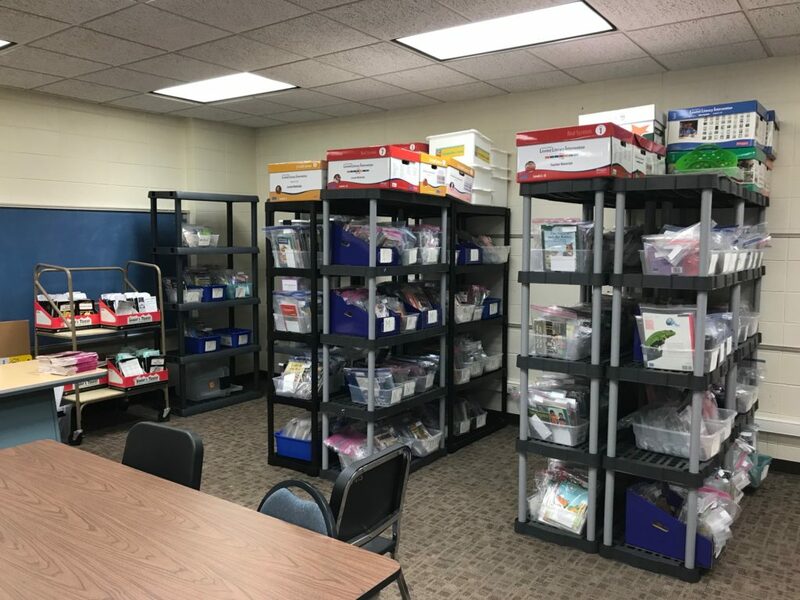 I have a new room, a new position (Reading Specialist), a new student population (6-8th grade, not just one grade level), and a renewed sense of drive and purpose. I’d love to show off my new room! Flexible seating was a major goal this year. Usually, I have 8 table groups for up to 33 students. But this year, I’ll be working with about 5 students at a time. 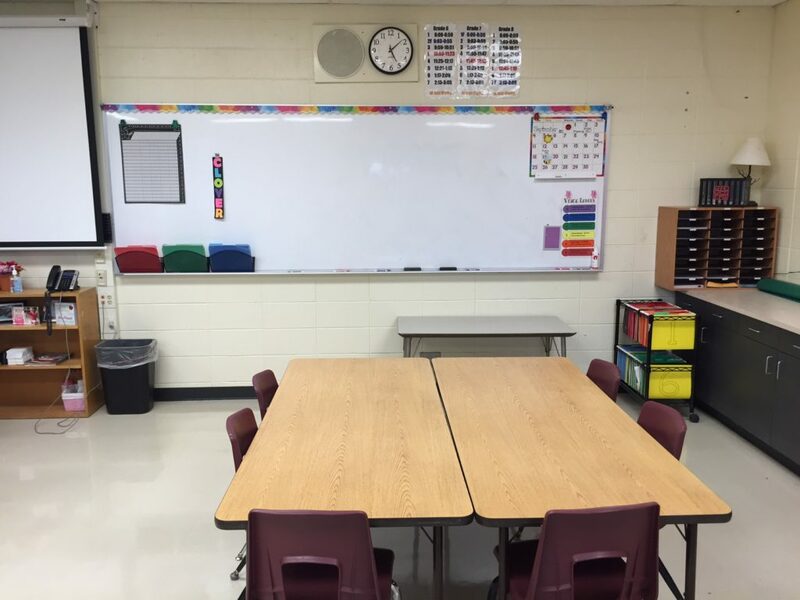 To honor their different learning preferences, I created different seating options within the classroom for them to choose what works best. Come on in – I’d love to give you the tour! Building relationships is THE most important aspect of my teaching practice. 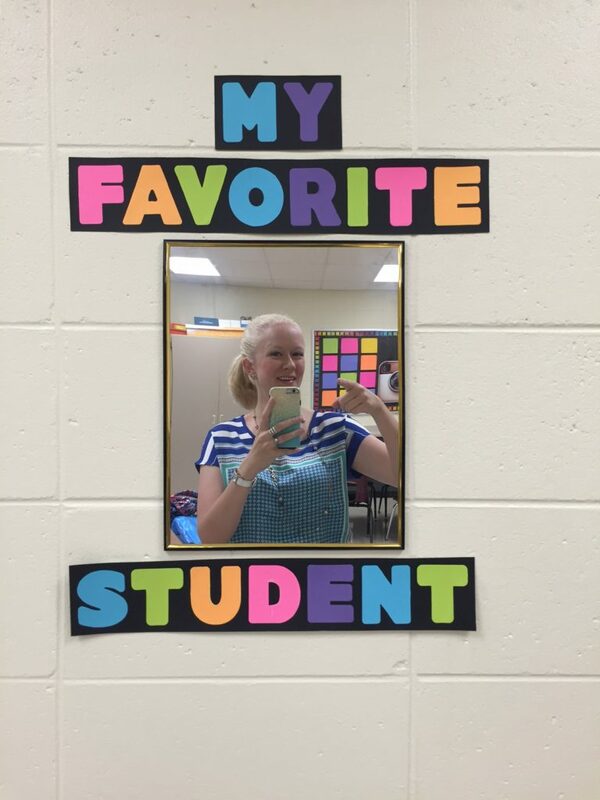 I get to know my students, and I let them know that I love and appreciate them. Humor also helps. 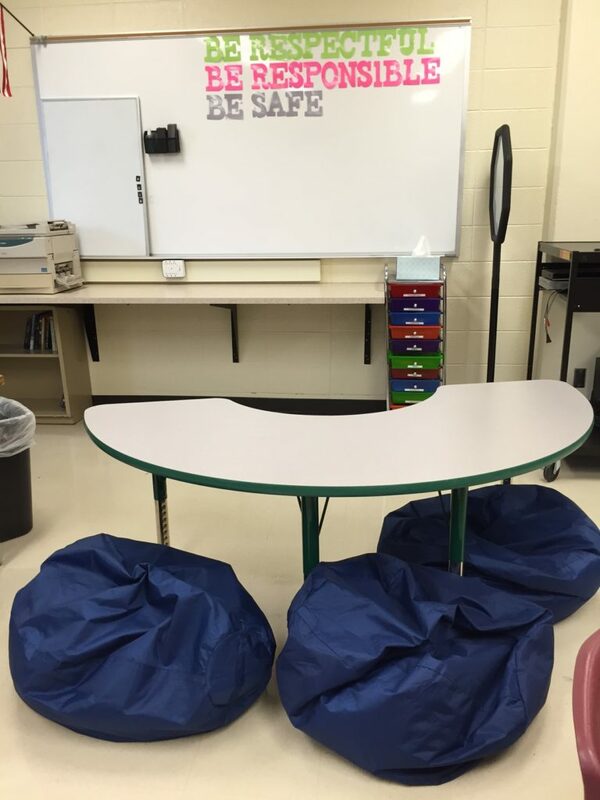 Here is the second flexible seating option. I anticipate using this one the most with my groups of 4-5. 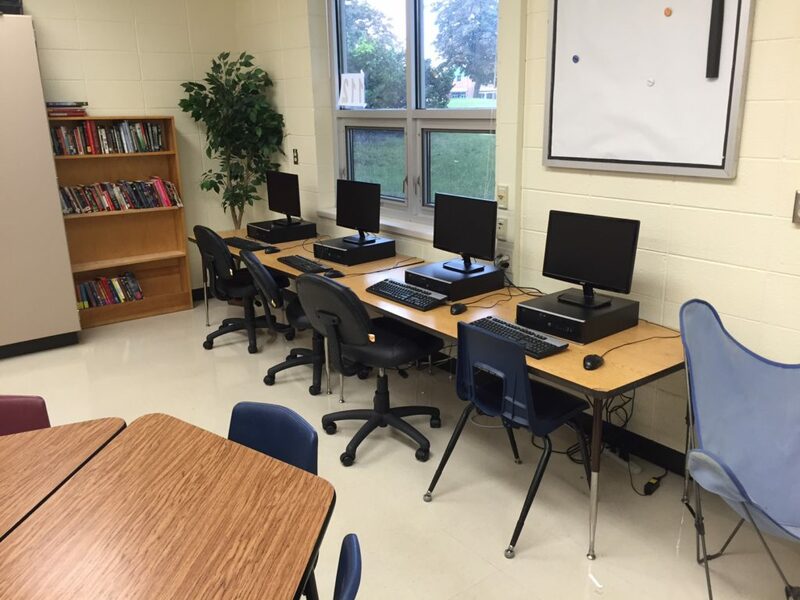 Here are our individual computer work stations. Each student has his/her own iPad, but as you can imagine, a desktop is preferable in some instances. 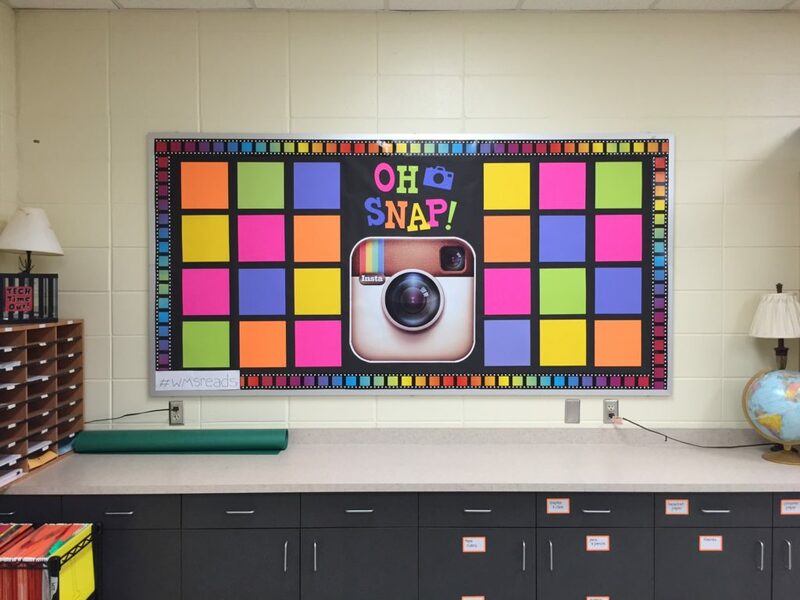 I am very proud of this new bulletin board: Fridge Worthy. 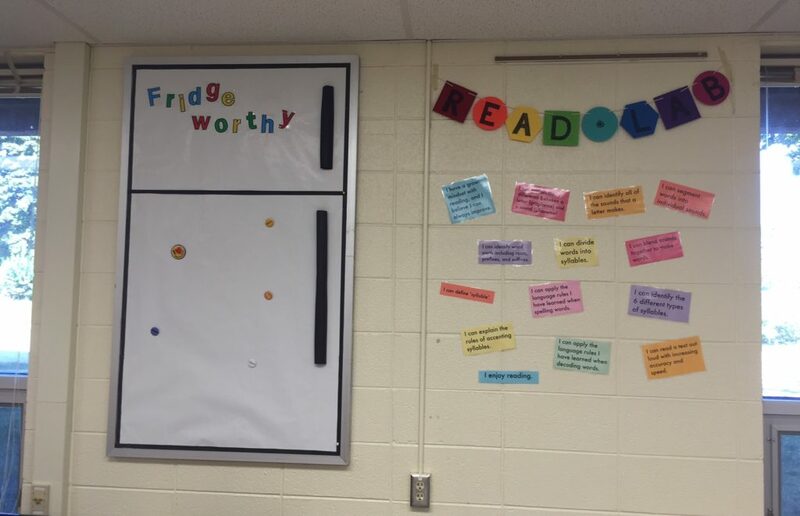 Since my students (Tier 3 for Reading Interventions) need a major boost in confidence and a huge dose of love, I decided to incorporate this ‘praise board’ of sorts. They can post ANYthing they are proud of – it doesn’t have to be for reading. I’d like them to come into the room and have a feeling of pride and recognition. Secondly, I have also posted my learning goals and targets for the year. I’ll have another set from which I will select the target(s) of the day and place them prominently on the front board. There aren’t many in my program, but they are all critical. 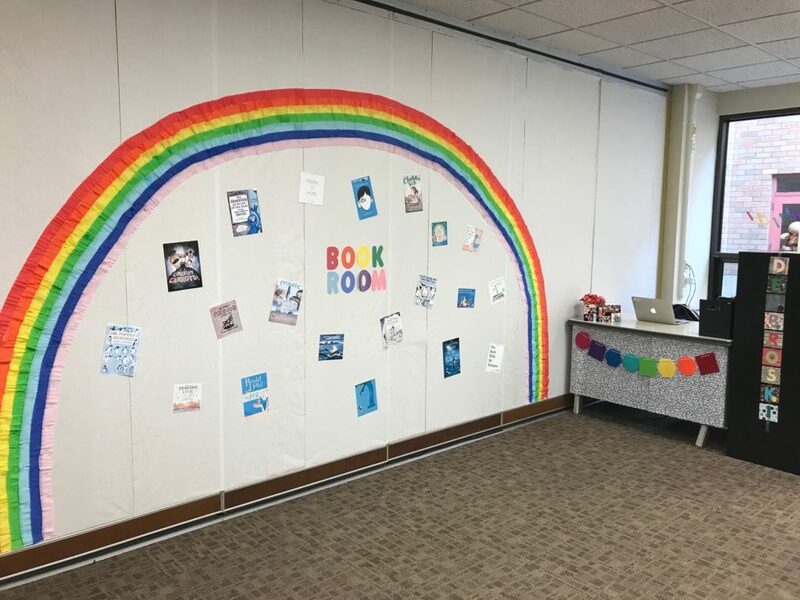 Oh, and you might have noticed that I chose a name for my new room: THE READING LAB. Zing. It’s gonna be a great year! Congratulations, Week 29 Survivors! Enjoy these highlights from the week! We will vote again today (Friday) and Monday. I’ll be back on Facebook and the blog to keep you updated! 2. 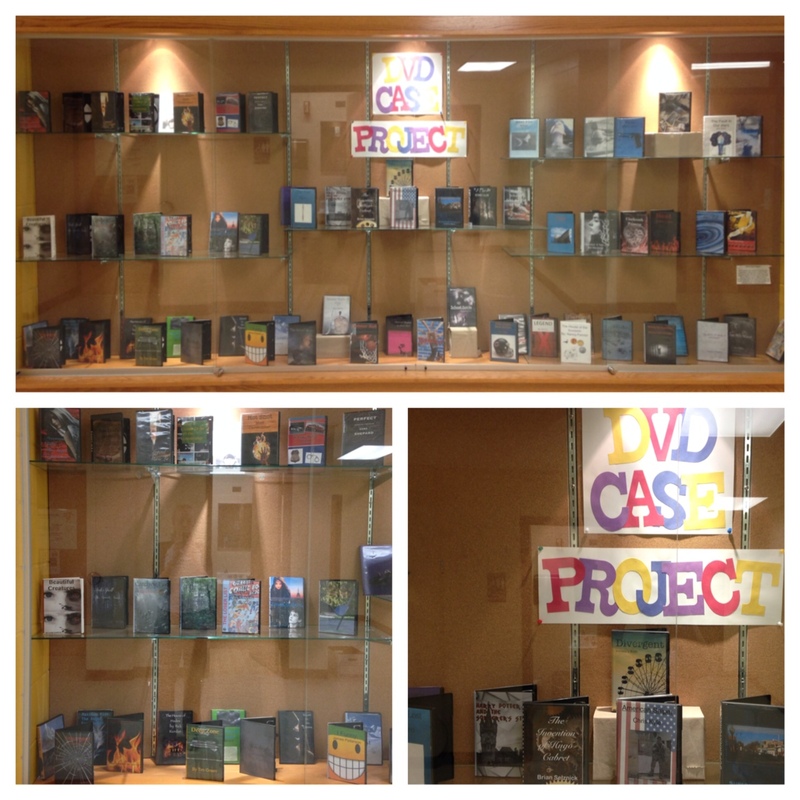 DVD Project Display – I finished another display of my students’ DVD Case Projects. We have such a beautiful case to display their amazing work! 3. And Isn’t it Ironic? – I taught my students about Irony this week. 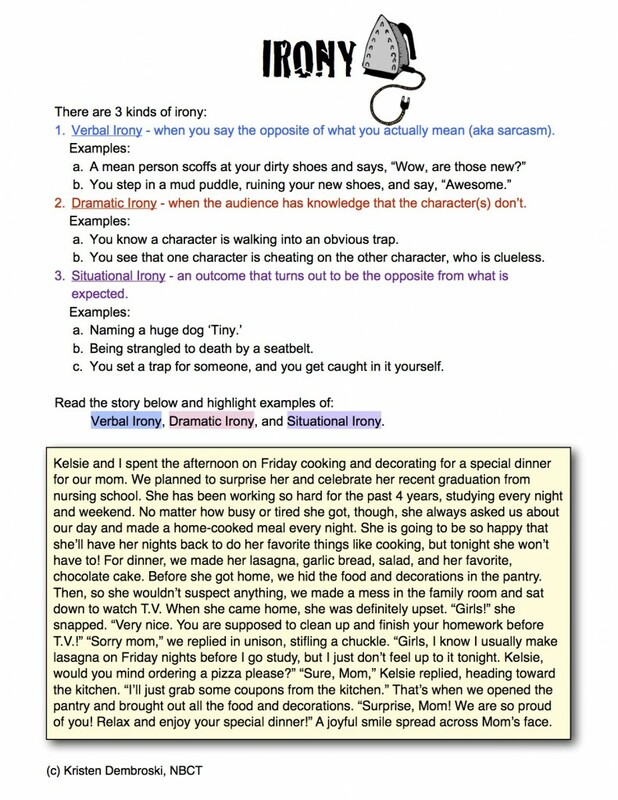 We even listened to the Alanis Morisette song “Ironic” and discussed how none of the examples in the song is actually irony (with the exception of Mr. Play-it-Safe saying, “Well isn’t this nice?”), and how the real irony of the song is the inappropriate name. It should be named, “Unfortunate Circumstances,” which would be a much more fitting title. Anyway, it was fun to watch their heads spin and churn and wrap themselves around this new concept. Like little light bulbs popping on one at a time. We had a good time and a good laugh! 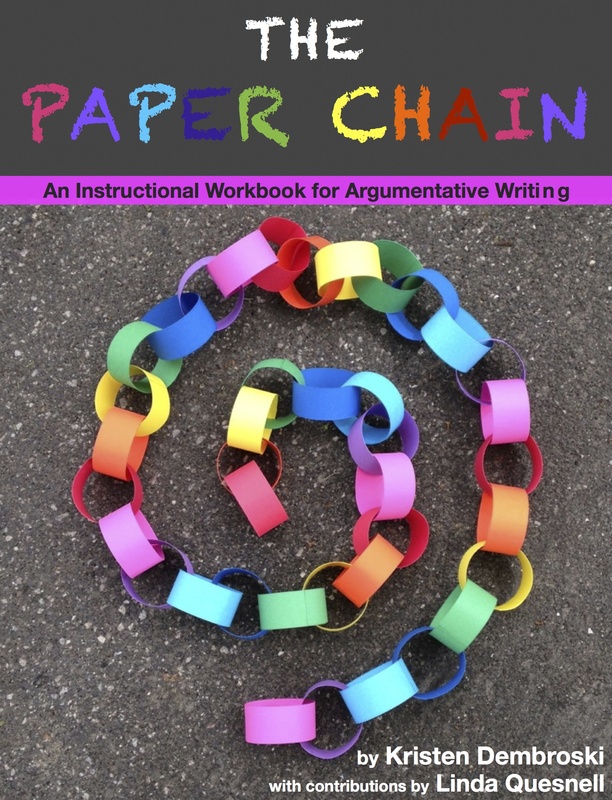 If you want to download the handout I used, I’ll put it up on TpT this weekend! 4. Neck…less? We’re reading the story “The Necklace” by Guy de Maupassant. 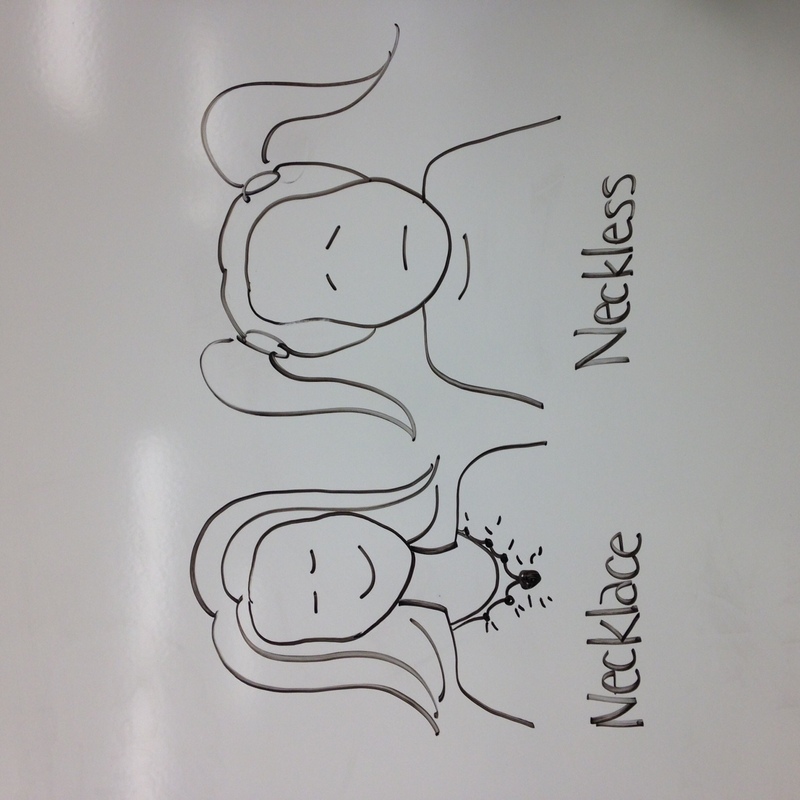 I had to draw this on the board this week because, well, isn’t it obvious? They were so oblivious of their own spelling errors that they didn’t even ‘see’ it at first. 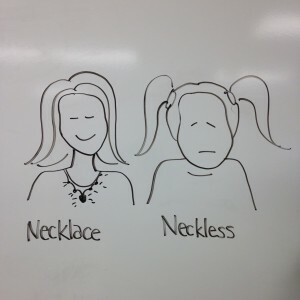 Yes, ‘necklace’ and ‘neckless’ ARE 2 different words! 5. 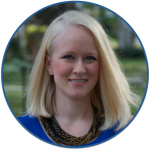 Healthy Eats – If you’ve been following this blog, then you know I loves my food, and I am trying my best to eat healthfully. My favorite quote about food is, “The food you eat can be either the safest and most powerful form of medicine or the slowest form of poison” – Ann Wigmore. I truly believe that. You are what you eat, and I want to be very mindful of what I put in my body. My husband bought us a juicer for my birthday, and we have been having so much fun juicing for breakfast! I tell him we’re ‘drinking the rainbow,’ haha! 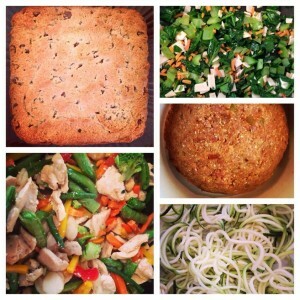 And the foods pictured above are from my weekly Sunday Cook-a-thon. 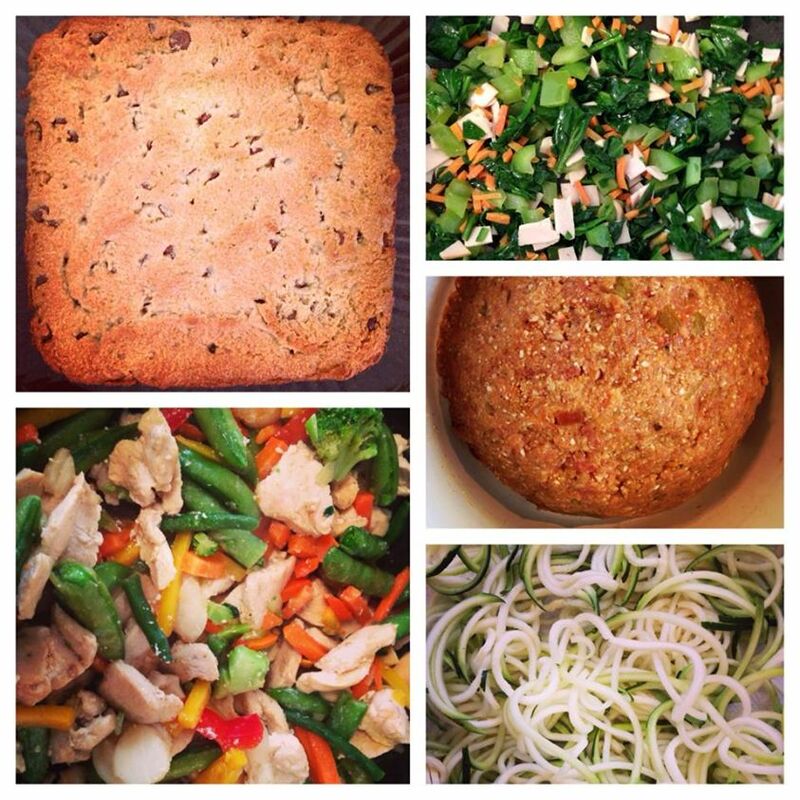 This week I made Grain-free Cookie Bars, Veggie Stir Fry, Fire-Roasted Slow-Cooker Meatloaf, Teriyaki and Veggie Stir Fry, and Zoodles, as well as our weekly Veggie-Egg Muffins for breakfast (all dairy-free, grain-free – Paleo). 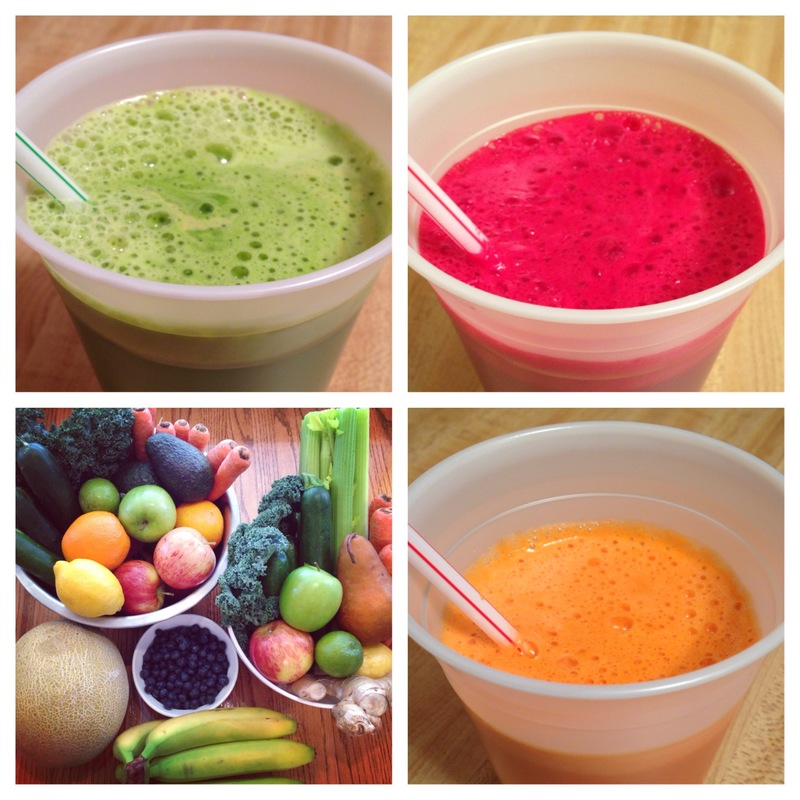 Add the daily juicing, and we are in good shape! By the way – I’m totally new to the juicing scene. If you have a favorite ‘recipe,’ I’m dying to learn more! Please leave a comment below!